A series of events in 2014 heightened tensions between Israelis and Palestinians to levels not seen in years, and the new year portends even more difficult times. Confrontations between Israelis and Palestinians ratcheted up following the spring collapse of efforts to revive the Middle East peace talks. This strengthened extremists on both sides, said Moshe Ma’oz of Hebrew University in Jerusalem. Militants on both sides are "feeding off one another, especially on the right-wing side," said Ma’oz, professor emeritus of Islamic and Middle Eastern studies. U.S. Secretary of State John Kerry’s nine-month effort to restart the Middle East peace talks fell apart in April. This came as the two major Palestinian factions, Fatah and Hamas, announced a unity government following a seven-year rift. Israel said it scuttled any diplomacy because Hamas refuses to recognize the Jewish state. The collapse of diplomacy, along with the June murders of several young Israelis and Palestinians, escalated into a 50-day conflict between Hamas and Israel in which more than 2,000 people were killed. The conflict, which ended in August without a formal ceasefire, left people talking about survival rather than peace, said a professor of national security studies at East Jerusalem’s al-Quds University. "The best thing, I hope, is that the bad situation – the current situation – stays as it is" and doesn’t deteriorate, said Zakaria al-Qaq. "This is my best hope." 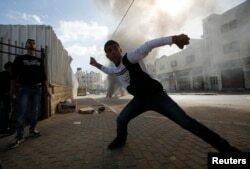 Clashes arose over access to this Jerusalem holy site. October visits by right-wing Israelis to the Temple Mount or al-Aqsa Mosque compound, revered by Jews and Muslims alike, sparked a new round of violence: spontaneous, lone-wolf attacks on Israelis, revenge attacks on Muslims and clashes in East Jerusalem and the West Bank. FILE - A Palestinian youth throws stones at Israeli troops following an anti-Israel demonstration in solidarity with al-Aqsa mosque in the West Bank city of Hebron, Nov. 14, 2014. As a result, feelings of hopelessness are widespread, Ma’oz said. "Despair – this is the conclusion now," he said. "Hopefully, things can change. As an historical analyst, I can tell you, no, things are moving, can change. There are all kinds of forces, you don’t see them." Al-Qaq, the al-Quds professor, said he believes the Israeli government and the Palestinian Authority will avoid any explosion of violence because both fear losing control of the situation. "They have a mutual interest to bother each other and annoy each other," he said, "but it’s not going to be ‘annihilate’ or ‘eliminate’ either party." Analysts foresee more turmoil and little room for diplomacy as Israel prepares to hold parliamentary elections in March and the United States, seen as important to any mediation, enters its lengthy 2016 presidential campaign.